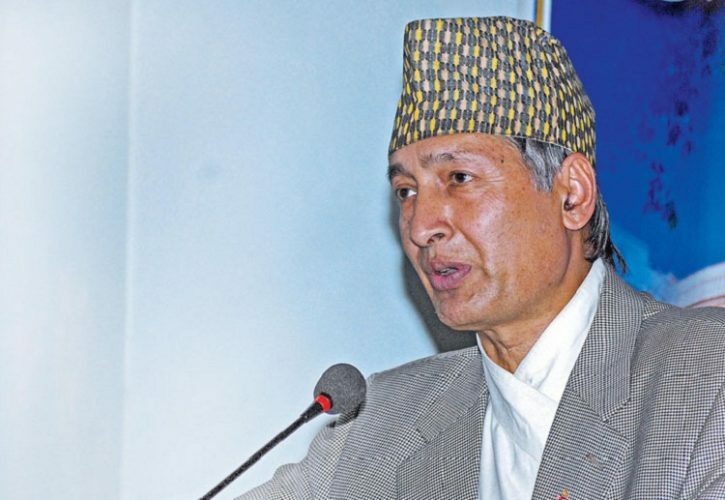 Washington D.C., USA –Finance Minister Dr. Yuba Raj Khatiwada has underscored the need of more cooperation from various sectors for Nepal's graduation to a developed country status from the least-developed country status by 2022. Addressing the joint meeting of the Executive Directors of the World Bank here on Tuesday, the Finance Minister spoke on the capacity of the local bodies, the roadmap of Nepal's development and priorities, continuity of economic reforms, sustainability of revenue and the overall business climate. Briefing the meeting about the strategy adopted by Nepal for its economic development, he said the country was committed to achieving the Sustainable Development Goals. Finance Minister Khatiwada urged the World Bank to endorse the framework of investment for the forthcoming five years, expressing that partnership with the World Bank would play significant role in Nepal's socio-economic development. Meanwhile, Finance Minister Khatiwada and World Bank's Vice-President for the South Asia Region, Hartwig Schafer, had a meeting. In response to a question by the WB vice-president during the meeting regarding the implementation of federalism adopted by Nepal, Finance Minister said the government is committed to fulfilling the aspirations of the people through some 36,000 people's representatives who were elected to the three levels. Minister Khatiwada said that the government was ready to work together with private sectors for the infrastructure development in economic and social areas. He further urged the World Bank for their assistance to institutionalize the federalism as internal resources alone were not enough in this bid. World Bank regional vice chair committed that the WB was ready to provide assistance in financial and technical areas and increase investment in private sectors noting that Nepal was achieving huge success in political sphere in the country. He further committed to assure the support from regional fund in the development of energy, transport and infrastructures. On the occasion, Minister Khatiwada urged the WB to support for project development for big ventures including running projects. The government is committed to creating investment friendly environment by carrying out legal and infrastructural reforms in energy sector, said the minister. On the occasion, the team had discussed opportunities for regional energy development while saying banking group was ready for possible assistances for the development of energy sector, and it was waiting for appropriate opportunity towards that end. Likewise on the sidelines of the meeting, Shanta Devarajan, Acting Chief Economist of the World Bank Group met with Minister Dr Khatiwada. On the occasion, Dr Khatiwada said Nepal has started some reforms in various sectors learning from the past. In return, Devarajan praised Nepal's reformation efforts in financial sector, he promised to continue exchanges of good deeds done by the World Bank with Nepal in the days ahead. The meeting was attended also by the Nepali delegation led by Dr Khatiwada comprising Nepal's ambassador to the United States of America Dr Arjun Kumar Karki and Sri Krishna Nepal, joint secretary at the International Economic Cooperation Coordination Division under the Finance Ministry. The three-day meeting that will conclude on Wednesday is expected to endorse investment model of Nepal.